By Charles T. Tart, Ph.D.
Bob here reporting from sunny Baja California. I found your site while searching "Creationism" or something. So what's the answer? I would much rather believe a believable lie than such a cold thing as (remember the song?) "we are flukes of the universe, we have no right to be here." I've pondered the imponderable, such as "why would God allow evil to enter his perfect creation?" And, "if it's all an accident, why can't I kill everybody I don't like?" Where are you going with your web site? What do you hope to accomplish? How are you making the world a better place? If it's all an accident and it's "survival of the fittest" Why do anything positive instead of just protecting your personal interests? I think I would rather believe in aliens than evolution. It's so meaningless. I don't need an answer. But really, I think you're wasting good bandwidth that I could use to download songs. Tart's book is just the kind of thing that someone like Bob in sunny Baja might find to his taste. 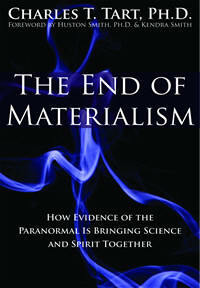 Anyone looking for new evidence or new arguments in support of immaterialism and the paranormal should look elsewhere. Tart says he wrote The End of Materialism "to help those who've experienced conflicts between their spiritual and scientific sides, or who are simply interested in aspects of science and the spiritual." These days I fall into the latter category (who doesn't?) In my younger days, however, I fell into the former category. Unlike Tart, who also admits to having to deal with this conflict, I have resolved the dissonance by gradually finding little of interest in the spiritual and more of interest in science, but not the kind of science Tart does (parapsychology). Like Tart, I believe that one need not choose between science and spirituality. One can pursue both, neither, or one or the other. He chooses both. I agree with him that to reject science is foolish. I don't find any need to seek anything "spiritual," but I don't find it necessarily foolish to do so. The pursuit of the spiritual is obviously something many people find necessary. They see no reason to live if there isn't something more than the material world. I can't remember ever feeling that way, even when I was a churchgoer (not that the religious is the same as the spiritual). I can't ever remember thinking to myself: "why don't these atheists just kill themselves? What's the point in living if this is all there is?" I think I've always felt that "this" is usually better than the alternative, that is, that being able to perceive, learn, enjoy, and even suffer, is better than not existing at all. I've been fortunate not to have suffered any great physical pain for an extended period of time. I've never had to deal with a natural disaster that killed all my loved ones. I've never had to go to war. I understand why some people might not want to exist, but I don't understand those who believe that life would not be worth living if they didn't have an immortal soul or some such thing. More common, perhaps, than spiritual people who see no reason to live if the material world is all there is, are those who would find life empty or meaningless if there were no spiritual dimension to it. Here I can empathize, for I do remember at one time feeling that my religion (again, I'm not equating religion with spirituality) not only gave me a purpose in life, but without it life would have no purpose. I don't think I came to think this way on my own. I believe I was taught this by my parents and religion teachers. When I grew up and became a student of philosophy (literally), I realized the error of this position. Meaning or purpose is not something that has to be given to you by another being. You do not have to be created to worship God, for example, in order to have a purpose in life. Some of the confusion about meaning and living is due to conflating a teleological universe (one that has a purpose) with a purposeful life. They have no relation to one another. The universe may be designed for a reason by some being or group of beings, but my life doesn't thereby become meaningful. In fact, if I were created only to fulfill a purpose given to me by my creator, my life would seem meaningless to me. I would be a puppet or plaything of the creator. A meaningful life is one that is fulfilling. As a child, of course, I could have no idea as to what would be a fulfilling life for me. As an adult, I see that there are many different kinds of lives that are meaningful or fulfilling. There is not one kind of life that everybody must lead in order to lead a purposeful, meaningful life. Tart's characterization of "scientistic materialism" as implying that human beings are nothing but an "inherently meaningless chemical accident" is at the core of his attack on materialism. It is also his biggest error. It is true that we atheistic materialists do not believe that the universe was created by anyone and that it does not have an inherent purpose. There is no single reason you and I, or the universe, exist. There are lots of reasons or causes that have had to conjoin for the universe to exist as it does today and for our being here. But it seems pretty evident to me that we're not here to fulfill anybody's plan. The number of contingencies that had to occur for each of us to be here today is staggering. If you had to predict it some 13 billion years ago, you would probably say our existence is impossible. It is a monumental leap to jump from that fact to the belief that my life is meaningless and without purpose. The universe may be purposeless and the result of billions of chance causes, but it is governed by the inherent nature of matter and energy, and thus has some order. Trying to discover that order, what makes the universe tick, is what science is all about. In any case, just because humans haven't evolved on our planet to fulfill anybody's design or purpose does not mean that every human is doomed to a meaningless existence. You can spend your days engaged in meaningless, purposeless activities, if you so desire. But you are not doomed to do so. It's up to you. Well, it's up to you within limits. Circumstances, many of which you have no control over, will limit your opportunities. I think this error, which we might call the spiritualist fallacy, is what leads Tart to say: "If materialism is really true, my reaction is eat, drink, and be merry (and don't get caught by others if they don't approve of your pleasure), for tomorrow we die—and life doesn't mean anything anyway" (p. 20, although at another place in the book he tells us that if materialism were true, he'd be devoting his life to health and longevity, and might have to take mood-enhancing drugs for depression). I believe materialism is true, but I don't agree with Tart that I should therefore lead a frivolous life, indifferent to the effect I might have on others. My life can be meaningful whether life in general is meaningful (whatever that might mean!) or whether materialism is true or false. What I think really gnaws at Tart is not so much a sincere belief that if the universe is purposeless, then so is his life, but rather the discomfort he is made to feel by atheistic materialists who see his spiritual longings as foolish, irrational, unscientific, even "crazy" (p. 8; he repeats this claim many times throughout the book). He begins chapter two by describing the "very uncomfortable position" of "yearning for something higher than simple material gratification, something 'spiritual,'" and living in a world that "seems to tell you in no uncertain terms that you yearn for nothing but fantasy—superstitious, outmoded nonsense that will make you less fit to live in the 'real' world." "Something in us yearns," he says, "for this higher thing we vaguely call 'spirit,' but we don't want to feel stupid or crazy." I have a hard time empathizing with this attitude because when I was a spiritual person I thought those who weren't spiritual were foolish and were devoting their lives to nonsense. I felt special rather than uncomfortable. As an adult (and an atheistic materialist) I've felt uncomfortable at times when working with people who thought I must be immoral and a bad person because I didn't believe in God. But the discomfort was no greater than that felt when I was made to think I was doing something immoral by drinking a Coors beer or a cup of coffee from Starbucks. In any case, before moving on to discuss what Tart means by 'spiritual' and what the evidence is for the paranormal that will bring science and spirit together to crush materialism, I have a couple of other bones to pick regarding his characterization of materialists. I found little discomfort in reciting the creed because I agree with most of the statements included in it. I believe the universe is material, that there is no non-material reality, that the universe had no creator and has no objective meaning or destiny, that belief in spirits and gods are delusions, that consciousness is a purely physical process, that values arise from biological determinants, that churches have no real use except to provide social support, and that there is no afterlife. There were a couple of items in The Western Creed, however, that made me uncomfortable, not because they are false and I would be unhappy if they were true, but because I know they are mischaracterizations of what materialists like myself actually believe. Like the rest of life, my life and my consciousness have no objective purpose, meaning, or destiny. Most rational values I can personally live by must be based on the knowledge that for me what pleases me is good, what pains me is bad. Rationality requires that friends and enemies be used in ways that maximize my pleasure and minimize my pain. Virtue for me is getting what I want without being caught and punished by others. What troubles Tart, however, is not that he can't trust materialistic atheists or that he suffers anxiety attacks at the thought of becoming one himself. No. What troubles Tart is that he and many other spiritual questers "have been hurt by ... a widespread social put-down that has invalidated our spiritual hopes and dreams and told us we're fools. We've been hurt not only in the sense of feeling like fools but also in possibly feeling on a deeper level that we've missed out on what's really important, missed out on the higher things of life, or have experienced neurotic suffering as the spiritually affirming and materialistically denying parts of our minds struggle." I wouldn't feel too sorry for him, however. He's made a career out of identifying the scientistic materialistic beliefs that he thinks give rise to some folk's neuroticism, and he's devised "therapies" to help people achieve their spiritual goals. There is a substantial subculture that feels as Tart does, that will attend his workshops and talks, and buy his books. He should be grateful for scientism, instead of railing against it. It provides him with a hook to catch unhappy spiritual questers. The problem is not science but scientism, he tells us. Science, he thinks, is his friend because he thinks science has found compelling evidence for the paranormal, which is one place where Tart seems to find a lot of "spirituality." Scientism, on the other hand, is the enemy because it is embedded in our culture and subconsciously subverts the spiritual quest, while consciously making questers feel like superstitious idiots. The goal of Tart's book, it seems, is to slay the enemy with science and proclaim clear sailing for believers in the paranormal and the spirit world. ...the soul of man is immortal...the universe is so built and ordered that without any peradventure, all things work together for the good of each and all, that the foundation principle of the world is what we call love and that the happiness of everyone is, in the long run, absolutely certain. This vision of "cosmic consciousness" was produced by psychiatrist Richard Maurice Bucke (1837-1902). Tart introduces it very early in his book and returns to it again and again. Unlike Tart, Bucke did not come to this vision as a result of studying the evidence for the supernatural or the paranormal and reasoning logically from that evidence to the conclusion that it is highly probable that these things are true. Bucke's vision came to him after reading poetry by the likes of Wordsworth, Shelley, Keats, and Whitman. The experience was life changing, said Bucke. That kind of life-changing "illumination" is what Tart considers to be "spiritual." Tart doesn't seem to have had any great mystical experiences himself, but he clearly longs for one, even one in the perineal area, which is where his friend Allan Smith's began (p. 332). "Spirituality," he says, has been a matter of personal choice. If I had to come up with a description of what spirituality means to Tart, I'd have to say that for him spirituality is a kind of mood enhancer. It's a word he uses to describe a kind of fuzzy feeling that his life is meaningful and important, and that despite all the apparent evidence to the contrary, everything is good and we're all going to find happiness when we escape the physical world. It's a common sentiment of "spiritual" people and, as Tart notes, it is not identical with being religious. This cosmic vision leads one to find cheerfulness and hope in a world that often seems hopelessly demented and bent on destroying everything good and decent. It is the vision that says "peace on earth and good will toward men." How can anyone be against such a noble sentiment? I'm not. But Tart doesn't promise us a poem. He promises us the scientific evidence that will be the end of materialism and teases the reader with the hope of survival of consciousness after death. And he promises that that evidence is to be found in research on the paranormal. Does he deliver the goods? Tart claims that "direct experience is always the final arbiter of what's the best truth" and that science has discovered that some experiences "cannot be reduced to materialistic explanations." He divides science into two kinds. He calls parapsychology, or any science that supports belief in the non-material realm, "essential science." Science that denies the non-material realm is "scientism." (He also distinguishes skepticism ["an honest search for better truths"] from pseudoskepticism ["debunking"].) He ignores the rest of science, which is what 99.99% of science is: the attempt to understand and explain the natural world without reference to a supernatural world. Natural science doesn't deny the existence of the supernatural or the transcendent, but it does deny that reference to such metaphysical notions to explain anything in the natural world is science rather than philosophy. There are, of course, some scientists who are parapsychologists and materialists. Dean Radin, for example, makes it clear that he and others think that someday psi will be explained by natural laws as yet undiscovered, and that possibly quantum physics with its concepts of weird things like entanglement might provide the science needed to explain such things as precognition, etc. Tart praises Radin, but he makes it clear that he does not think quantum physics is the answer to the parapsychologist's prayers. Tart still puts his money on the view that psi won't be explained by quantum physics. He doesn't even mention Brian Josephson. Although Tart doesn't provide any new evidence for telepathy, he does review some of his own early work on using immediate feedback to enhance psi ability. He claims he got positive results, but was unable to do the large-scale replication study needed to impress the scientific community because he couldn't get funding. His complaint is a familiar one among parapsychologists, but in his case the lack-of-funding-prevented-me-from-doing-a-proper-study argument doesn't ring true. I don't doubt that his grant proposal was rejected, as he says, and that at least one scientist who saw his proposal thought it was a good one. But Tart had his chance at the big bucks when Robert Bigelow, a wealthy Las Vegas businessman, decided to throw a good chunk of his fortune into the parapsychology hat. After retiring from the University of California at Davis psychology department, Tart spent a year developing a curriculum and teaching as the director of Robert Bigelow’s endowed Chair of Consciousness Studies at the University of Nevada at Las Vegas. Bigelow gave nearly $4 million to UNLV in 1997 to investigate such subjects as dreams, meditation, hypnosis, out-of-body experiences, telepathy, and the ever-popular subject among college students, drug-induced altered states of consciousness. (In 1971, Tart authored On Being Stoned: A Psychological Study of Marijuana Intoxication.) Bigelow pulled the plug on the program in 2002. No explanation was given, but perhaps the fact that in five years the program had produced nothing of interest—despite being led by Tart, Raymond Moody, and Dean Radin—might have had something to do with it. One wonders why Tart didn't use some of Bigelow's money to do the large-scale study he lamented not being able to do because of lack of funding. Instead, he seems to have used the money to promote what he already believed to be true. Even more disappointing is Tart's attempt to explain why telepathy is nonphysical. It's nonphysical, he says, because it can't work like a radio, quantum physics hasn't yet found a physical explanation for it, and hoping for a physical explanation for telepathy to be found in the future isn't scientific. (For that matter, hoping for a non-physical explanation for telepathy isn't scientific, either.) None of these reasons are compelling. I agree with Tart that there is no physical way a mind in California can directly communicate with a mind in Australia without using something like a telephone, which, by the way, seems to be a much more efficient and accurate way to communicate with someone at a distance than trying to read his mind. I was hoping, however, that he might provide this skeptic with some new evidence in support of the view that telepathy is real. After all, if evidence for the paranormal is going to bring science and spirit together to end materialism, you'd think he'd put more emphasis on the evidence. No. Tart assumes the evidence is in. He tells us that he has been "personally bored for decades with the controversy" over whether "psi perceptions provide a sound basis for openness to the reality that at least some spiritual aspects really exist." His task, I guess, is to explain how the evidence undermines materialism and supports dualism. Some readers are going to recognize, however, that you don't undermine materialism by assuming that processes occur that can't be explained by physical means today and are unlikely to be explained by physical means tomorrow. When one joins this assumption and the belief that skeptical critics are irrational with the rejection of any alternative explanations for the data (psychological, statistical, physical, pathological, etc. ), one has created an impenetrable shield around one's beliefs. Some readers might find Tart's belief that psi provides evidence of our spiritual nature a bit perplexing. What does telepathy have to do with spirituality, some might ask? Everything, according to Tart. Telepathy, he says, might be the mechanism involved in prayer and could provide scientific evidence for belief in prayer's efficacy. It should not be surprising that Tart does not examine the scientific studies that have attempted to test the efficacy of prayer. If he did, he might have to consider that these tests indicate telepathy is an illusion. Some readers will find it annoying that Tart repeatedly asserts that the data is primary and theorizing is secondary, while he skips over or ignores the data that is inconvenient to his theories. Despite his awareness of the power of how cognitive biases can blind us to the implications of evidence and lead us to confirm our biases despite overwhelming evidence against our views, Tart seems to have been blinded by his desire for spiritual experience. "Without the meaning that spiritual experience gives life," he writes, "I imagine I'd be quite depressed." He reminds me of what psychologists were like when they were philosophers rather than scientists, when introspection was their field of inquiry. If you want to know more about the inner workings and private thoughts of Charles Tart, by all means read his book (although he doesn't reveal much about his personal life—he and wife camp and he's never been to Rome). If you are looking for new evidence or insights into the old evidence for the paranormal, you'll be wasting your time reading The End of Materialism. When he says that "we" ignore psi and spirituality at our own peril, he means he would do so at his own peril. One reason he feels the way he does about the importance of immaterialism is his mistaken notion that spirituality has provided us with our most important values. He is correct in claiming that materialistic science didn't give us transcendent values, but he is incorrect in assuming we need spirit to provide a basis for our values. I discussed this above and only want to mention at this point that values like tolerance, liberty, and equality are argued for most forcefully by secular philosophers like John Locke and John Stuart Mill. Even John Milton's argument for freedom of speech is secular. Our important values are neither materialist nor spiritual. Tart exposes his anti-materialist bias when he asserts that "materialists reject the idea that there's anything special about life....Life simply means that when you get just the right combinations of physics and chemistry, you get self-sustaining, self-reproducing actions that constitute life as we know it." Nothing could more special than life, especially when one considers the difficulty scientists have had in creating living things out of non-living materials. Once life is here it may seem inevitable and abundant, but it is with awe and wonder that this materialist looks at the story so far about the origins of life. Life not special?! Such a thought is inconceivable to me. As with his chapter on telepathy, there is no new evidence for clairvoyance presented here. Much of the chapter is devoted to describing how remote viewing experiments are done and singing the praises of the likes of Hal Puthoff and Russell Targ. He repeats the same stories Radin and others have presented, such as the one about Pat Price and Star Gate and the Pearce-Pratt experiment. How about Tart's evidence or argument that clairvoyance supports a belief in the immaterial world? There's not much here to consider. He simply asserts that "clairvoyance, as we currently know it, is nonphysical from the perspective of a classical, Newtonian universe" and it can't be explained by "extremely low-frequency electromagnetic radiation (ELF)." Again, as long as one rejects alternative explanations for the data, Tart's case is airtight, even if it begs the question. How about precognition? Does Tart have any new evidence or arguments to present in support either of precognition or of immateriality? If you've been following the story so far, you are able to see what's ahead without resorting to any psychic devices. The only surprise in this chapter is that in one of Tart's frequent excursions into his own mind and belief system, he reveals that he finds the idea of precognition incomprehensible and doesn't want to believe in it because it would take away free will and make "life both senseless and boring." Unlike Bob on the beach in Baja, however, Tart is willing to look at the data and he is impressed. Unfortunately, it is the same data that Radin's gone over, including a heap of praise for meta-analysis by Honorton and Ferrari, and offers nothing new. Also, despite his dislike of the idea of precognition, he claims that he has proof of it from his own experiments. He did what many other psi researchers have done: he turned a failure to produce psi into a success by moving the goalposts. Instead of evaluating how his subjects (or co-investigators) did in a card-guessing experiment, he evaluated how they did with respect to the card that came after the target card. Magically, he turned psi-missing into psi-hitting. Perversely, Tart turns this trick of changing the goal of an experiment after the data is in from a vice to a virtue. Since he didn't want to believe in precognition, but the data supported it, he was making "the data primary over theory and belief." That sounds much better than "mining the data." As noted above, Tart seems more interested in himself than in the evidence for his beliefs. His attitude toward precognition provides another example of his preoccupation with his own personal development rather than with the impersonal world of scientific research. Not only does he tell us about how he overcame his aversion to the concept of precognition by turning psi-missing into psi-hitting, he tells us that he even came up with a theory to explain the process of psi-missing. He calls his idea "transtemporal inhibition" and wonders in bold print whether he's come up with a breakthrough discovery or just a clever idea. He tells us he hasn't tested the idea, but that others should. This time he doesn't blame lack of funding for not doing the science and testing an idea that he describes as "perhaps...my most important scientific discovery...." He tells us that he got interested in remote viewing research, which he considered "sexier" than what he was doing. And, he says, he needed to devote a lot more time to his "personal spiritual-growth work." I find it hard to imagine a scientist in any other field thinking he had discovered a breakthrough idea but leaving it to others to find out. From what I understand of the history of science, breakthrough ideas are few and far between. They are what gives science the necessary tools to progress in knowledge. It is surprising, then, to find Tart rather indifferent about the fate of his "possible" great idea. Testing it by trying to devise experiments that might falsify it, rather than looking to what others have found to see if they might provide confirmation for it, would have set Tart off as a first-tier scientist. Instead, he comes across as lazy and indifferent, more interested in his own thoughts and spiritual growth than in the progress of parapsychology. As with telepathy, clairvoyance (remote viewing), and precognition, Tart has nothing new to add to the evidence for the reality of PK. He brings up the famous case of D. D. Home, which he defends on the curious grounds that men in olden times were no more susceptible to trickery than parapsychologists today. Tart ignores the history of psi research that is replete with examples of eminent men of science being duped by children, magicians, conjurers of all sorts, and even subjects in their psi experiments. Tart is absolutely correct: eminent scientists today are just as susceptible to being deceived and tricked as they were one hundred and fifty years ago! Tart also cites Dean Radin's meta-analysis (with Diane Ferrari) of PK studies, mostly involving trying to affect the outcome of a roll of a die. I've dealt with Radin's work on PK elsewhere, so I won't repeat myself here. Some readers, familiar with the history of psi research, might find it odd that Tart makes no mention of Robert Jahn's work (PEAR), Helmut Schmidt, or Jeffrey Mishlove's book on Ted Owens, The PK Man. Instead, he spends much of the chapter reviewing some work on trying to affect the outcome of a coin flip that he did with Andrija Puharich in 1957. The work is so old, he didn't even remember it himself. He tells us he had to review some old papers to remind himself that one fellow in a trial got 100 out of 100! (He may have forgotten this trial, he says, because he may have a deep resistance to PK.) Tart also reviews some experiments he did in the 1970s with a machine he had built to do coin tosses. He seems more impressed with the machine than with any evidence for PK. Tart does provide an innovative example of special pleading in parapsychology by saying that data mining when an experiment indicates no psi effect is actually looking for "some sort of secondary effect," which, he says, "is relatively common in parapsychological studies." This, he says, has led some in the field to think that there's something "inherently perverse" about psi phenomena, that researchers are being "teased" by it. "It's as if psi happens often enough to keep us interested, but not reliably or strongly enough for us to be certain about it or apply it very well." Indeed. Tart makes no argument regarding the nonmaterial nature of either psychokinesis or psychic healing, so it is not clear how he thinks either of these phenomena support either his linkage of science to the spirit world or his claim that psi provides evidence for the immaterial nature of mind. He expresses his admiration for Larry Dossey in this chapter, but the only research he presents in favor of psychic healing was done in 1965 and it involved non-replicated studies on barley seeds and mice. Tart doesn't even mention the healing prayer studies published in the last decade, much less make an effort to evaluate them. He skirts over the whole issue of psychic healing in a little over six pages, as if he were bored with having to present all this wearisome data! In the end, Tart's case for the end of materialism is underwhelming. He doesn't even do a good job of presenting a strong case for the existence of any of the "big five" psi phenomena. This book couldn't help anyone who is conflicted about the spirit world because it is written as if there is no need to prove the existence either of psi or of spirits. It is written for those who already reject materialism, accept the reality of the paranormal, and don't really care one way or the other what science has to say about either. Given his treatment of the "big five," the reader need not be precognitive to predict that Tart is not going to provide any slam-dunk evidence or arguments from the research in areas he considers possibilities but not yet proven: postcognition, OBEs, NDEs, communication with the dead, and reincarnation. This should disappoint some readers, since these secondary topics, with the exception of postcognition, are traditionally linked to the spirit world, while the "big five," with the exception of healing prayer, are not. It is certainly possible that a non-material mind comes into existence with the brain in some animals, including humans and dogs, but such an epiphenomenon could just as easily go out of existence with the death of the animal in which the brain resides. For most people with "spiritual" inclinations, this would not be very satisfying. They want to live forever and they want to live, for the most part, without the bad side of having a physical body. They want to be able to do things that they now do with a body, such as feel, perceive, worship, think, and the like. But they don't want any meanness or pain, except for those they would condemn to eternal torments in hell. The literature on out-of-body and near-death experiences, on reincarnation, and on mediums getting messages from the dead seems more likely to be attractive to those who want to live forever as a "spirit." Yet, the research in these areas, in Tart's opinion, hasn't proved to a high degree of probability the reality of a spirit detached from the body. Tart believes that some OBEs may involve a mind that leaves a body, but most are either hallucinations or perceptual constructions (simulations, is Tart's word for it) informed by ESP. Tart's view is that "our minds and bodies are telepathically and psychokinetically connected to wherever the mind is 'located'." Thus, for Tart, an OBE or an NDE "may well be another semiarbitrary, constructed simulation of whatever reality actually is." As far as we know, he says, the mind could be "located somewhere other than the physical body, and may or may not use ESP to learn about the 'outside' place where it is, rather than its being completely absorbed in the brain and nervous system simulation of the physical reality around the physical body." In short, we may have a soul that is not dwelling in the body. If this sounds like philosophy rather than science that's because it is. Before Charles Tart was born and even before modern science developed, we knew that we may have a soul that can exist independently of the body. This knowledge didn't and can't end materialism. Of course, dualism is possible. Tart, however, falsely promises to show that dualism is true, that there are some things that can't be explained by anything but dualism. He doesn't fulfill his promise. In his discussion of NDEs, Tart continues with his exposition of what he thinks is going on between our mind and our brain. The mind gets intimate knowledge of the brain and body by auto-clairvoyance and uses auto-PK to affect the operation of the brain. Surely he knows this is not a testable hypothesis. Or does he? He says we need "an immense amount of research" to fill in the details of his solution to the mind-body problem. I can't imagine that kind of scientific research on the brain producing anything but evidence for materialism. It seems likely that neuroscience will continue to discover that electrical or chemical stimulation of certain parts of the brain can evoke NDE-like or OBE-like experiences. Philosophical speculators like Tart will probably continue to imagine alternative explanations, but since philosophers don't usually do brain science, it is unlikely any research they do will shed much light on these issues. What kind of experiment could detect a non-physical mind using PK to produce an NDE? Tart simply asserts that some things can't be explained materialistically, but once again he shows only that it is possible to come up with a model of experience that postulates a non-material mind. We've had such models for millennia. Tart's main message, the one that is likely to resonate with his uncritical readers, is that materialism or scientism denies and invalidates "spiritual or transpersonal longings and experiences." This has a "psychopathological effect" on some people, causing them "unnecessary individual suffering," isolation, and cynicism. This makes the world a worse place, he thinks. Given the fact that those of us who don't have these longings to live forever without the bad side of having a body are far outnumbered by those who do, I find it hard to feel sorry for Tart and his fellow travelers. They own the road and have caused their share of misery not only on atheistic materialists but on each other. Tart devotes two chapters to after-death communication, one to spontaneous experiences and one to mediumship. Despite his frequent dirge about the meaninglessness of life without an afterlife, Tart says he "has little interest in the future." That may explain why he hasn't personally investigated mediumship, but it also makes his quest to provide a case for spirit survival rather pointless. If anything is likely to disappoint the reader looking for spiritual support it will be Tart's admission that he has no idea what life will be like after death. He indicates that the idea of immortality isn't one he can make sense of because the concept of 'eternity' is incomprehensible. And he is pretty sure that whatever survives won't be a personality and ego. What is most puzzling to me is that there doesn't seem to be any point to survival of consciousness. One would think that if life would be meaningless if one doesn't survive death, then life after death should have some profound meaningfulness to it. If Tart thinks whatever survives his body's death is going to lead a meaningful existence, he's kept it a secret. Since most of the data for communication from the dead by mediums is clearly presented as if the spirits still retain their personalities and egos, it is understandable that Tart ignores the "work" of people like John Edward, James Van Praagh, Sylvia Browne, and their ilk. Anyway, in Tart's view most of the claims involving communication with the dead don't provide evidence for or against survival, but they do bring comfort to the bereaved. He says if he didn't believe in an afterlife, he'd be depressed and probably need to take mood-altering drugs to be happy. But it isn't at all clear why he wouldn't need mood-altering drugs to be happy given his view that life after death isn't going to be like life with bodily perceptions minus the bad stuff and last forever. It's also not clear why he doesn't comment on those mediums who are clearly exploiting the grieving, not comforting them. He provides us with nothing we don't already know when he reminds us that if the mind is non-physical, it might survive the death of the brain. Like many other parapsychologists, he thinks psi can best be explained as phenomena existing outside of space and time and impervious to physical shielding. Tart, however, seems to go further when he implies that psi can be explained only in non-material terms. If that were true, then he could easily make his case that the presence of psi means the end of materialism. He assumes no physical explanation will ever adequately explain psi, and he believes that there is an abundance of evidence for psi that can't be explained away by the many alternative explanations given by skeptical critics (whom he ignores anyway and considers "irrational"). While he doesn't try to provide compelling evidence for life after death, Tart does reveal some significant biases in his discussion of the issues of testimony and cold reading. He reveals that he thinks superstition is not a serious problem for intelligent, educated, careful observers. Because of this bias, he tends to think that a story from a scientist is more likely to be true and deserves to be taken as highly credible. (He collects these kinds of stories on a website, by the way. Of course, he has no website for those to post their stories of ghosts that turned out to be non-paranormal.) He dismisses cold reading in a sentence or two and doesn't even discuss subjective validation, the process by which people endow words, images, or symbols with personal meaning and significance. Tart gives no indication that he is aware that cold reading can occur unconsciously and without the intention to deceive by people who are not "magician mentalists" or "fraudulent psychics." Despite his own warning that anecdotes don't provide scientific proof of anything, his book is full of anecdotes of compelling stories that are going to prove interesting to many people and be taken as full proof by some. The chapters on communication with spirits are no different. In one chapter he features the story of Joseph Waldron and in the other his primary example is Eileen J. Garrett (1893-1970). In the chapter on NDEs, he featured the story of Pam Reynolds. The main reason Tart doesn't accept examples of OBEs, NDEs, spirit apparitions, or readings by mediums as proof of spirits leaving the body or communicating with living minds is that he's not sure that some sort of psi might not be involved. Just as a stage hypnotist can get a shy patron to impersonate a clucking chicken or a rock musician, so a medium might unconsciously impersonate a dead person. Or the medium might be "unconsciously using telepathy to pull information from the mind of the sitter inquiring about the deceased or unconsciously using clairvoyance to pull relevant information from physical records." Parapsychologists who take this kind of speculation seriously refer to the possible unconscious application of psi as super-psi. In addition to finding the work of Ian Stevenson "suggestive" but not proof of reincarnation, Tart reveals that he was smitten as a young man by Morey Bernstein's The Search for Bridey Murphy. He even met Bernstein in 1957 and to this day believes what Bernstein told him. The editor of the Chicago American discredited the Bridey Murphy story because he was "very angry at Bernstein for not giving his paper early rights to the story and had told Bernstein he would get back at him!" According to Tart, Bernstein told him that the woman interviewed in the story and identified as Bridie Murphey Corkell from Wisconsin was actually the mother of the publisher of the Chicago American. Corkell provided evidence that the woman hypnotized by Bernstein, Virginia Tighe, did not regress to a previous life under hypnotism, but was recalling childhood experiences and stories she heard from Corkell. Frankly, I've never hear this conspiracy story before. Is there any truth to it? Tart gives no indication he had any interest in investigating Bernstein's claim any further. He does admit that there are lots of unconscious fabrications in the reincarnation literature, but that he thinks some of the stories are true. He admits, however, that he has no idea how many are true or how to determine which ones are true. He tells us he's dismayed that we aren't pumping research dollars into investigating this issue further, then he abruptly ends this chapter as if to say: "maybe in my next lifetime I'll investigate this further." Is this really the end of materialism? Many brilliant men have investigated the paranormal but they have yet to find a single person who can, without trickery, send or receive [paranormally] even a three-letter word under test conditions. Nor have they found a single person who can move a pencil across a table psychokinetically. But even if such people are found, I don't see how that would provide evidence for life after death, much less how it would demonstrate that life is meaningful, either here or in the hereafter. Tart hasn't convinced me that the existence of psi has any essential connection either to survival of consciousness after death or to living a meaningful existence before or after dying. In any case, I hope Tart gets to Rome before he has to find out whether some part of his consciousness continues when his brain turns to mush.